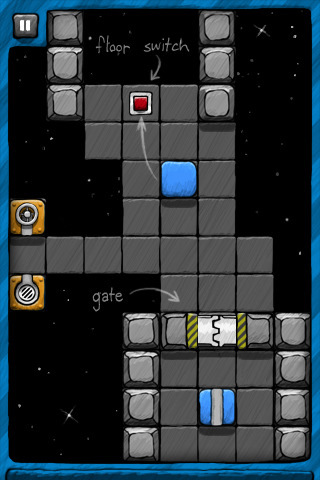 Aqueduct is a sadistically fun and complicated little puzzler from Kieffer Bros for both your iPhone and iPad. The “Aque” in Aqueduct is a play on water, and there are lots of pipes that the water needs to pass through. 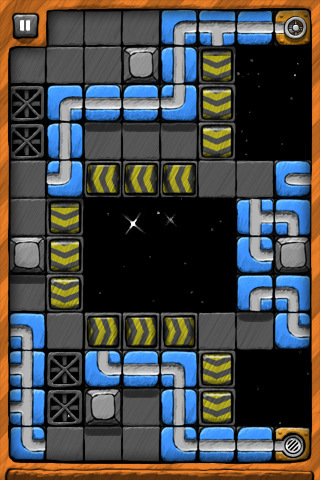 In an endless stream of levels with increasing complexity, you move puzzle pieces to form a pipe that enables the water to pass from the faucet through to the drain. In total there are 8 stages in Aqueduct, each with a bunch of levels that you unlock as you progress. The first stage has 23 levels, the 2nd stage has 25 and so on for a whopping of 190 puzzles in all. The playing board is made up of an 8×12 grid of squares. Each level has a varied layout. You start out with a lot of floors and few blocks that form simple pipes. Before you know it you’ll be creating bridges to move pieces around space, jumping through teleports, stepping on floor switches, running into locked doors and sliding across conveyor belts, while trying to form your pipe path. You move the pieces on the board along the floor by dragging them to their destination. Aqueduct will eventually start feeling like the fifteen puzzle game. The board gets busy and you’ll have to massage and maneuver your pieces to get them to go where you need them to. The music in Aqueduct is this medley of eerie space travel and spooky movie scenes, that fits perfectly with the game’s overall mood and sound effects. The graphics, while not earth shattering, are extremely sharp and polished. You’ll be hooked on this game from the moment you start playing it, always trying to finish one level to unlock a new one. If you’re at all excited by puzzlers, Aqueduct is a no brainer, just buy it. After playing it for a few minutes, your brain will be so indulged in its addictive goodness, you’ll have to put off whatever else you planned on doing next. AppSafari review of Aqueduct was written by Joe Seifi on August 17th, 2010 and categorized under App Store, Featured, Fun, Games, iPad apps, Puzzler, Universal. Page viewed 3968 times, 1 so far today. Need help on using these apps? Please read the Help Page.